The student prepares for FA 99a, the first semester of the Honors Thesis project in the coming year, initiating discussions with the faculty member who will serve as the principal advisor for the thesis (if) when the student is accepted for the honors program. For 2018-19, this will be Tory Fair. 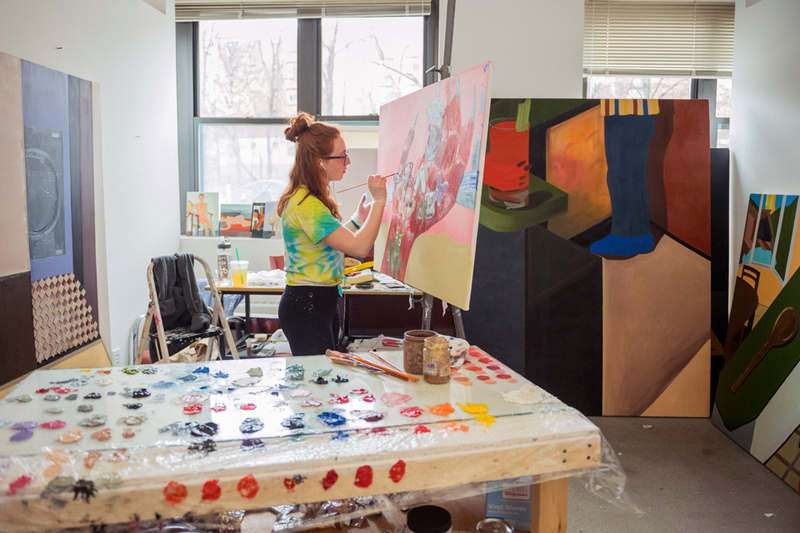 Students are advised at this time to apply for a Remis Summer Fellowship to engage in studio practice over the summer to prepare for the thesis year. A student must have an average of 3.0 in Fine Arts courses and Department approval before registering for FA 99a. The Fine Arts Department faculty member, Tory Fair, in consultation with the Chair, forms an honors committee of 3 faculty members. The principal advisor, Tory Fair, will serve as the head of the committee. This committee will guide the students throughout the year. Student must initiate one on one studio visits with each member of the thesis committee individually to review studio progress and written artist statement. Each member of the committee should visit your studio twice in the semester to review your ongoing project. Student will meet with the honors committee in a group review in December before final exam period. Epstein common critique room or various installation spaces can be used for this review. In some cases, Dreitzer gallery may be used during the senior studio exhibition. The first draft of the artist statement will also be reviewed. A grade will be sent to the registrar. A successful 99a semester leads to a spring 99b semester that must be enrolled in at the beginning of spring semester in January. An unsuccessful 99a semester prohibits the studio thesis from continuing in the spring semester. In this case, the 99a is counted and converted to an independent study 4 credit endeavor. January, February, March: Student must initiate one on one studio visits with each member of the thesis committee to review studio progress and written artist statement. Initial proposal for oral defense installation discussed and examined by thesis advisor. With thesis advisor, student will finalize proposal for thesis exhibition and date and time of review with the full thesis committee. Oral defense of the thesis by the student before the honors committee, followed by the meeting of the honors committee to determine the majority vote the recommendation determining department honors. N.B.—letter grade for 2nd semester Honors Thesis (FA 99b) due to Registrar by May 6, 2019. The studio oral defense is in two parts. First, the student is required to give a 15- minute image presentation accompanied by a written artist statement to be given to each member of the committee. Students present their work in digital form and should include references to other artists that have influenced their process. This event is open to the public. The second part of the defense takes place in front of the thesis installation with the full thesis committee. Location of the defense is determined at start of spring semester and may vary from student to student depending on specific site needs.